The strike is also likely to have a positive effect on the morale of teachers in other states who are fighting cuts driven by legislators’ unpopular austerity plans. Last week, teachers in nearby Pittsburgh, which shares a media market with much of West Virginia, voted to strike within 96 hours unless their demands were met. Administrators in Pittsburgh conceded to the union and within two days signed a new contract that met most of the teachers’ demands. In Oklahoma, teachers earning even less than their West Virginia colleagues announced that they have been in communication as they plan a similar statewide walkout. A recent survey by the Oklahoma Education Association of its 10,000 members found that 80% of them supported a strike. “A school closure is a last resort, but we are preparing for such an event in case the legislature refuses to show bold leadership and act,” the Oklahoma Education Association president, Alicia Priest, told the Oklahoman. To read the full dispatch, go to the Guardian. 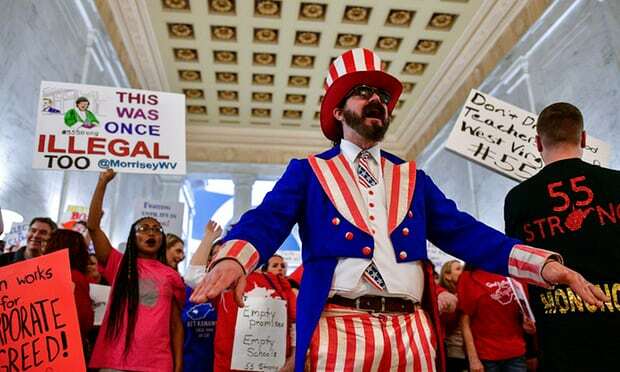 Be the first to comment on "What the West Virginia Victory Means for Labor"